2015 has been the celebration of the 300th anniversary of the death of King Louis XIV the builder of the Versailles. For Louis XIV the beauty of the gardens were as important as the palace itself and André Lenôtre architect and landscaper of the gardens because of the exceptional achievement of these masterpieces of lace construction became the friend and confidant of the King. His vision and sense of aesthetic of the gardens continues today to inspire creators from all over the world. Don't miss this unforgettable evening in the Versailles gardens with their illuminated fountains and water shows as they were displayed in the 17th century. The evening will end with the fantastic and enchanting fireworks show that will illuminate one of the most magnificent gardens and palace in Europe. So don't miss this exceptional evening that will please adults as well as children! 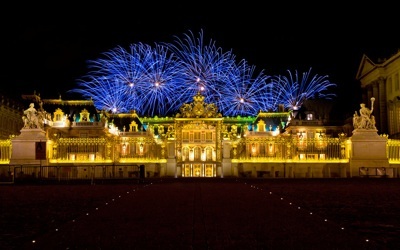 INCLUDED in this Versailles Gardens Night Show! *The entrance fee to the gardens, fountain shows and fireworks.